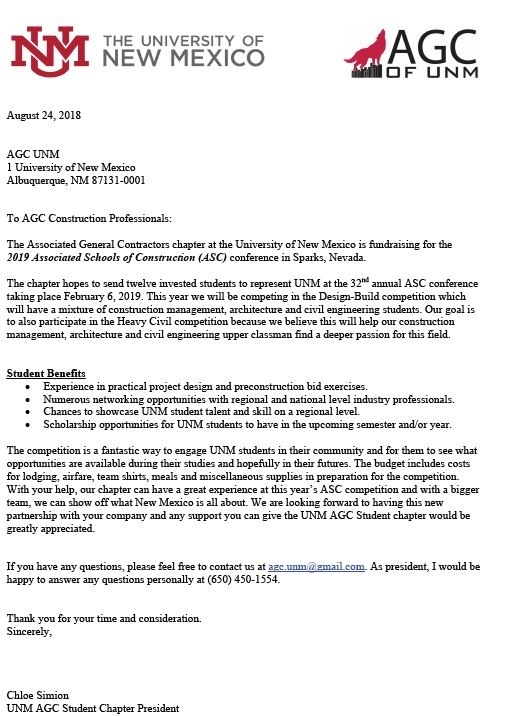 The AGC UNM Student Chapter will be sending their top-notch student's to Sparks, NV to compete in the 32nd Annual Associated Schools of Construction (ASC) Student Competition. Please join us in January to help coach AGC/UNM’s student chapter Design-Build team students. This practice session aids the students in strengthening their presentation skills and your feedback/questions will benefit them greatly on competition day. contact Kelly Roepke-Orth to RSVP. Additionally, the AGC UNM Student Chapter is requesting fundraising support to assist in this invaluable experience, furthering their industry career goals. AGC UNM Student Chapter Letter - If anyone would like to donate, checks can be made payable to and sent to AGC-UNM at 1 University of New Mexico, MSC01 1070, Albuquerque, NM 87131. Thank you for supporting workforce development excellence and the AGC UNM Student Chapter.